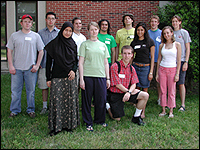 ISR welcomed 12 students to our summer Research Experiences for Undergraduates (REU) program. This program brings together talented undergraduates from across the country to participate in focused, 10-12 week summer research experiences with individual ISR faculty members. It is funded by the National Science Foundation. This summer's students come from Brown University, the University of Pennsylvania, Virginia Tech, Rochester Institute of Technology, Purdue, SUNY Genesco, Saint Louis University, the University of Maryland Baltimore county, as well as the University of Maryland.